You tend to understand that you can’t take like too seriously. After all, you will have plenty of time to be serious when you’re older. Yes, life is to be lived lightly. Except Halloween. Halloween is to be taken very, VERY seriously. It’s a good thing you have a foolproof idea of how to strike fear into the hearts of your classmates and teachers alike, this year. After all, there is only one thing that scares Batman, and that is the awful agent of chaos known as the Joker. We figure if he’s scary enough for Batman, he should be scary enough for you, right? This clownish prince of crime doesn't play by the rules (sound like someone you know? ), which troubles the dark knight, who’s set on keeping order in Gotham…kinda like your principal. Arrive to class dressed as this evil-doer and watch as the seven kids dressed as Batman all turn ashen, wishing the Batmobile—not the school bus—was coming to pick them up and whisk them to the Batcave. While we know your class will love a good scare, best save your mischief and trickery for after the final bell. After all, the Joker always had impeccable timing. 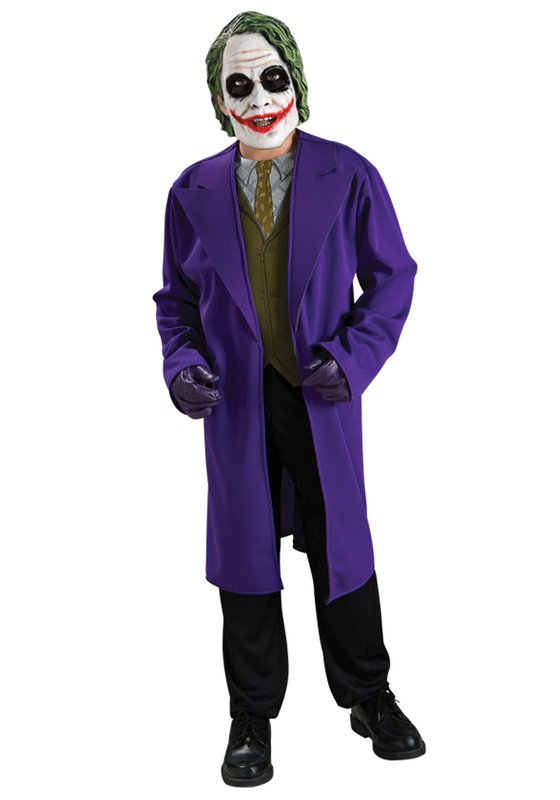 Trick-or-treating will prove a perfect opportunity to run through the neighborhood in this iconic long purple jacket and rubber mask, screaming and laughing like a maniac. Why not even bring your pal dressed as Batman and you can continue your longstanding rivalry and argue all night over who is deserving of the best candy! Our vote is with you. Mostly because you're terrifying in this costume!